I recently took part in an excellent series called Genre Grandeur for the month of July, over at the wonderful Movierob, where the genre of the month is alien films! 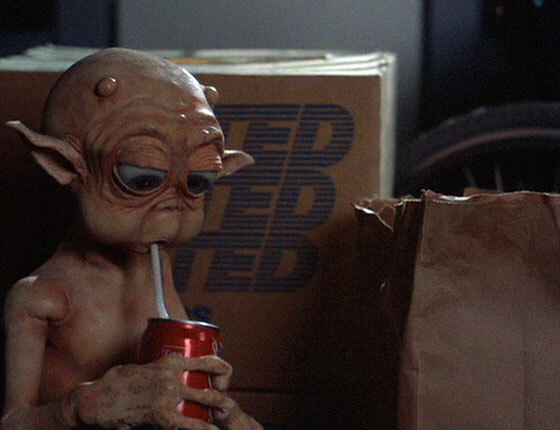 I used this opportunity to finally watch a bad film classic which just so happens to be about aliens – Mac and Me (1988). 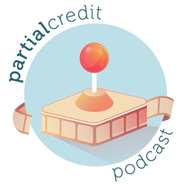 I love reading Rob’s Genre Grandeur review series so I’m happy I finally took part in it! You can read the rest of the Genre Grandeur posts here. On to the review! Well known for its insane amount of product placement, and seemingly blatant plagiarism of the storyline of E.T. 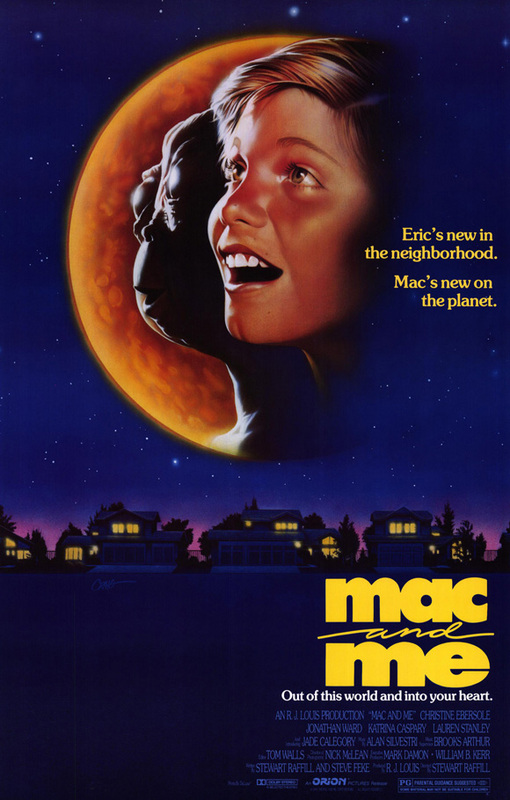 (1982), Mac and Me (1988) tells the story of a young boy named Eric who is wheelchair-bound. He and his family are moving to a brand new town and he feels sad about it, until he discovers an alien stowaway in his house who injects some excitement into his drab situation. Eric and his new neighbourhood friends must protect the little alien – named MAC, which stands for Mysterious Alien Creature – from the government authorities that are tracking him down, and hopefully reunite him with his alien family. This film is commonly known as one of the worst films ever made. I would tend to agree with that assessment, just because on top of all the plagiarism it’s also pretty boring. The bloopers are out of control and every scene seems to have something wrong with it, whether it’s a horse running into a van during a random scene where a van is driving next to wild running horses (?!? ), or cups at McDonalds clearly having no drink in them as they tumble over at a slight wind, or cameramen being visible whenever there’s a glass surface. One particularly lame thing I noticed was that the alien is either made out of small puppets, or a child in an alien suit, so his size changes from scene to scene. The adult-sized aliens are also incredibly creepy because their faces are set in a permanently surprised expression and they wobble around like they’ve taken at least eight shots of some high proof alcohol. The main characters are pretty annoying, but after a while you don’t even notice them because the film’s mistakes totally overshadow them. I previously mentioned the product placement, which actually becomes quite funny because it’s totally shameless. Here’s a standard line of dialogue in the film: “Oh, the alien only drinks COKE.” Or, “Don’t you really feel like a BIG MAC?” Or, “Mom, have fun at your new job at SEARS!” Or, “Wow, the alien only eats SKITTLES!”. One character seems to spend the whole film wandering around in a McDonalds staff uniform. It’s unknown whether this film was intended to be a vehicle solely to shill all of these products and services, but the giant dance sequence set within a McDonalds restaurant seems a bit fishy. That scene is actually amazing though, due to its pure cheesiness. I thought it was the highlight of the film. The scene is well worth a watch on Youtube. 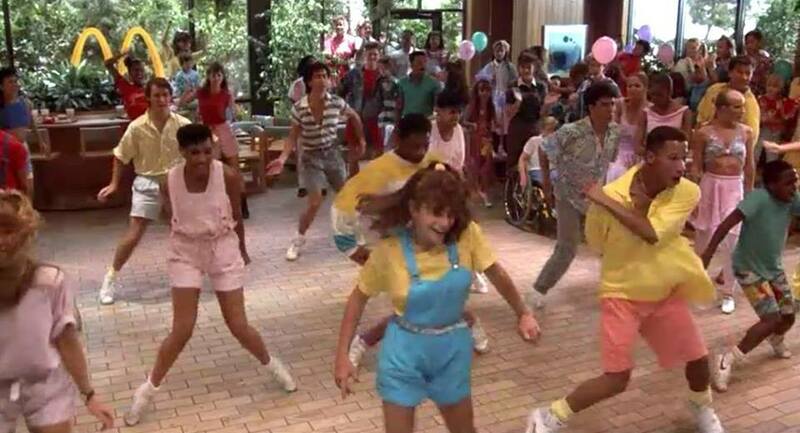 The dancing is so 80s that it’s hilarious, and the idea that all of these kids would combine forces to have a massive synchronised dance party in a McDonalds is really funny. Plus it got me feeling nostalgic for the McDonalds birthday parties I attended as a kid, with that awesome ice cream cake. But I digress. Other than that one dance sequence, there aren’t really any highlights in this film apart from its general awfulness. Even though this film was really bad, I did enjoy watching it because I felt like I was watching a special moment in bad movie history. It’s just so poorly put together and cheesy that you almost feel sorry for it. This would be a good one to watch if you’re drunk or have to take some really strong pain medication, or if you feel like experiencing the very specific joy that comes from watching a bad film. Thanks for taking part in this Anna! I totally don’t doubt that the alien’s name is product placement too! It’s so shameless that it’s funny! Particularly when it’s so haphazardly shoved into the dialogue. They’re always talking about eating Big Macs! Seriously having a huge LOL over here. Every time I see that scene I find something new and hilarious about it. I also love that he’s tricked them so many times! OMG too funny! Pheeew just flying over a cliff in a wheelchair. No big deal. This is one of my favourite bad movies. Spot on review; every negative point you made is a reason I love it! I think it’s now one of my favourite bad movies as well! It would make an amazing drinking game. HA HA HA – Where’d you get that picture of me drinking a coke?? You can find anything on the old Google nowadays! haha i like that last line there — “the very specific joy that comes from watching a bad film.” I often get the hankering for that feeling, but it hasn’t been so strong as to watch something THIS bad, I don’t think. Man this movie seems relentlessly bad! Thanks Tom! 🙂 I do love that bad film feeling. This is horrible but there’s nothing better than watching a complete, unashamed trainwreck. The ending is the absolute worst/best, which I didn’t even address because I didn’t want to spoil the hilarity. Just so bad! I’ve avoided this for years. Lately, I’ve seen it referenced often (and reviewed) so I might just take the plunge. Great post. Thanks Wendell! 🙂 You have to see this, it is hilariously bad. Anna omg! I used to love this horrible, horrible movie!! I would watch it over and over again, I was so half mesmerized and freaked out by that alien. Don’t judge lol. I always remember that scene where the mom alien is carrying the watermelon. So freaky and definitely the McDonalds scene. You are right I think they mention Big Mac and McD’s so many times, I am sure McDonalds paid to make this movie. So funny!! I can’t believe I am seeing this movie referenced somewhere that is priceless. PS.. this also would make a great Shitfest movie. Hahaha, that is amazing! Those adult aliens were so disturbing! I also loved the final scene of the film that promised a sequel that never happened, so funny. There’s just so much Shitfest potential in this one!